Cultural competency begins with knowing who you are. Interactive, engaging and fun -- this workbook is filled with valuable exercises, worksheet, games and clinical strategies to help you become more culturally competent. Use this powerful tool to explore cultural communities, religion, spirituality, gender, sexuality and disability. You'll find unique activities to help you reflect on your own attitudes, prejudices, and develop new skills for working with and building rapport with diverse clients. Leslie Korn, PhD, MPH, LMHC, has over 35 years of experience in cross cultural counseling, research, and traditional healing practices. She is the author of Rhythms of Recovery: Trauma, Nature, and the Body, Nutrition Essentials for Mental Health: The Complete Guide to the Food-Mood Connection and Multicultural Counseling Workbook: Exercises, Worksheets & Games to Build Rapport with Diverse Clients. For U.S. and Canadian customers, a CE test is available for 19.99 USD per participant. International CE rates may vary; please contact our Customer Service at 1-800-844-8260 for more details. "A comprehensive, collaborative and insightful workbook, it offers the clinician opportunities to reflect on their personal cultural identity and socialization while encouraging a deeper understanding of the role of power, privilege, and the complexities of culture, ethnicity and race in other cultural communities. This workbook provides practical worksheets to help professionals moreover establish rapport and relationship with their clients. Dr. Korn's book is a gift to the field of mental health and will support culturally responsive professionals." "A wise traditional birth attendant from Darfur once told that 'knowledge is like a garden: if it is not cultivated, it cannot be harvested.' Leslie's workbook is an effective fertilizer to cultivate multicultural counseling in the garden of clinical knowledge. It's a great resource for clinicians and healers to develop multicultural competencies and mindfulness to diversify their work. It can also be used as a 'refresher' for many kinds of helping professionals." "As a university faculty member and clinical practitioner, I think Dr.Korn's book is a wonderful, comprehensive and much needed resource for cultural competency development. The narrative assists the reader in the exploration of one's personal cultural self-awareness and helps the acquisition of new skills. I found this workbook to be the best multicultural counseling field guide I've read in many years. It provides a thorough compilation of information, worksheets and exercises that clinicians will value for a long time to come." "Dr. Korn's Multicultural Counseling Workbook is challenging, innovative, thought-provoking, educative, and experiential. All the qualities you want in an engaging workbook. When families and nations struggle behind unconscious masks of prejudice and bias, all efforts to heal illusions are welcome. The book is a valuable tool for nurturing change." "The importance of multicultural competency in our conflict-ridden world can't be overstated. It is in everyone's best interest. But the work involved in disentangling one's prejudices is intense, and this book is here to help. Designed for clinicians and clients, there is something here for everyone." "Leslie Korn has produced an impressive, highly accessible workbook on diversity and rapport building that will be of great benefit to counselors and professional help givers. Most importantly, it provides invaluable tools and exercises to facilitate better recognition, understanding and processing of feelings and beliefs regarding diversity in those of us who work in counseling. It is at the same time comprehensive and learned, yet highly readable with many case examples and illustrations. It is a gift to those who wish to be more adept in practicing in a more diversity-sensitive manner." 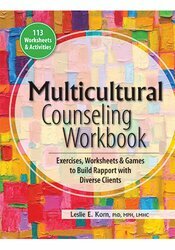 "The Multicultural Counseling Workbook provides and abundance of information about the cultural experiences of a variety or ethnic and other cultural groups, as well as practical exercises that encourage honest reflection, help identify assumptions and subconscious influences, while also challenging them to move beyond them. Some of the workbook's best moments are vignettes that show Dr. Korn's efforts to address sensitive topics, assess cultural influences and build therapeutic rapport with a variety of clients. I would recommend this workbook to mental health professionals seeking to increase their own as well as their client's cultural knowledge and self-awareness."